The soil conservation through watershed management helps in keeping the top soil intact . Further ,the dugout ponds , trenches and percolation tank are important watershed interventions for moisture conservation. Enhancing moisture in the soil is vital for the crop growth and development. The Agriculture terrace repair helps to keep the soil intact . Various water harvesting & extracting structure like Water storage tank , Village pond, irrigation channels etc helps to enhance the availability of water for irrigation . This way help the farmers in converting the rainfed area in to irrigated area. The harvested & stored water in water harvesting structures helps to provide life saving irrigation and supplemental irrigation. The controlled flow of water is important in any watershed . Any gushing flow of water can cause immense damage to watershed and hence to the Cropping area of Agriculture. The diversion drain, as one of the important intervention of watershed management allows a safe discharge of the water through the watershed area . This way prevents the losses to the standing Agriculture crop in field . The check dam in the similar way helps in control flow of water. The trenches has 2 ideal conditions for better cropping and hence acts as fertile bed for crops first it has nutritive top soil and secondly it has moisture . All these intervention are managed in watershed under the umbrella of watershed management. This way there is an effective increase in Agriculture and allied production. The increase in production helps the farmers to make profitable income through Agribusiness. This in turn help in better production. Further, the in-farm production of farm inputs like Certified seeds , Vermicompost and other Organic inputs through various watershed intervention in a watershed programme helps to cut down the cost of production .This way enhance the efficiency and profitability in Agribusiness. 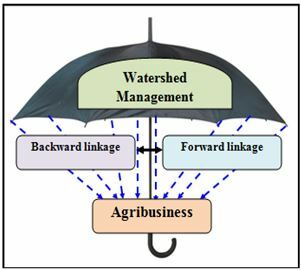 Along with getting a back ward linkage support , the watershed management avails the opportunity for market linkages and effective & viable supply chain management in the benefit of farmers, Thus providing an opportunity for forward linkages too. This way the farmers can get better value of their harvested produce.